The Ricoh Aficio MP6001SP provides you with a powerful all in one system that offers the very best in performance that will leave the competition trailing behind. The Ricoh Aficio MP6001SP includes a 100 ARDF - automatic rotating document feeder - allowing for simultaneous duplex (double-sided) scanning with an internal 160GB HDD to cater for network print and network scanning functionality that comes as standard. 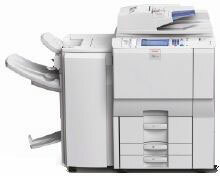 The Ricoh Aficio MP6001SP offers the following features. For additional technical information, please contact us today.